We had an article published in the October 2018 edition of Communications of the ACM. 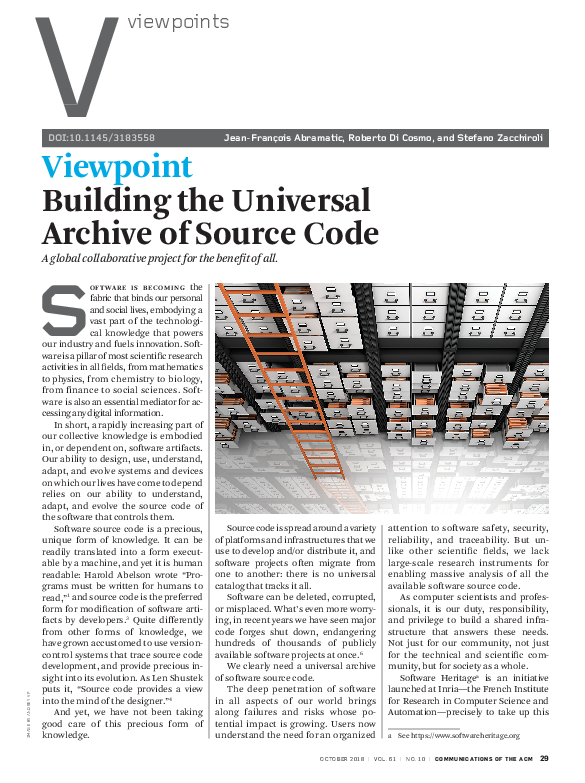 “Building the Universal Archive of Source Code” was written by Jean-François Abramatic, Roberto Di Cosmo, and Stefano Zacchiroli. The article includes a video with a presentation of Software Heritage and a virtual tour of our current headquarters in Paris. The article itself provides a concise overview of the mission behind Software Heritage, and goes on to talk about collection, preservation, sharing, and the future of Software Heritage. We recommend you check it out over at Communications of the ACM.